Welcome to the homepage of the USS Inaugural AM-242!! 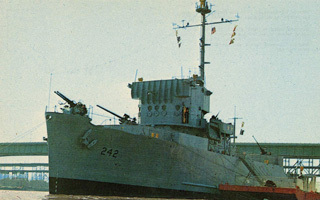 This is the online scrapbook of the WWII minesweeper, USS Inaugural AM-242. It has been set up to be viewed by former crew & their families, along with any other interested visitors. Take some time, sit back & enjoy this website. The USS Inaugural, or "Augie" as it is affectionately called by her former crew, was an Admirable Class minesweeper that saw active duty in the Pacific theater during WWII. After her commissioning on December 30, 1944, she participated in numerous sweeping operations in the vast mine fields off Japanese & Korean waters. Her duties were toughened by the perilous threat of attack from Japanese submarines & kamikaze pilots. The Inaugural most notably took part in the bloody battle for Okinawa. With the path cleared of underwater explosives, the American Naval Fleet progressed to a complete victory against Japan. The USS Inaugural earned 2 battle stars for WWII service. In 1968, the Inaugural became a floating museum on the Mississippi River in St. Louis, Missouri. For many years she was a landmark beneath the north leg of the beautiful Gateway Arch. In 1986 the USS Inaugural was designated a National Historic Landmark by the National Park Service. Tragically, during the Flood of 1993, she broke loose from her moorings & subsequently sunk. To this day, she is lying on her port side in the Mississippi, rusting away. Several unsuccessful attempts have been made to restore her, or sell her for scrap. 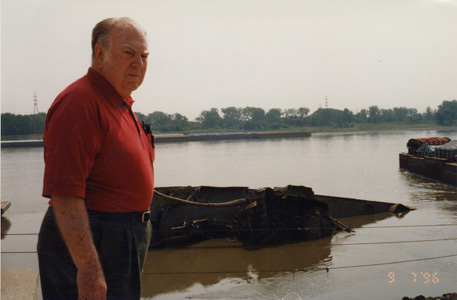 Below is a picture of my Grandpa, shipmate Vincent "Mike" O'Connor, viewing the "Augie" in her dismal state. It is a sad fate for such a beautiful ship. This site is dedicated to this magnificent minesweeper, her valiant crew & to all other American military personnel who so bravely completed their patriotic duty during the Second World War. USS Inaugural AM-242 Copyright © 2001-2010 Jared Johnson All rights reserved.